Children that are 3 years old or younger can board the bus for free, and can sit on your lap. All above named prices are tax included. Visit the highlights of Rotterdam with City Sightseeing Rotterdam, a sightseeing tour in a Hop-On Hop-Off bus like you see in the big cities. 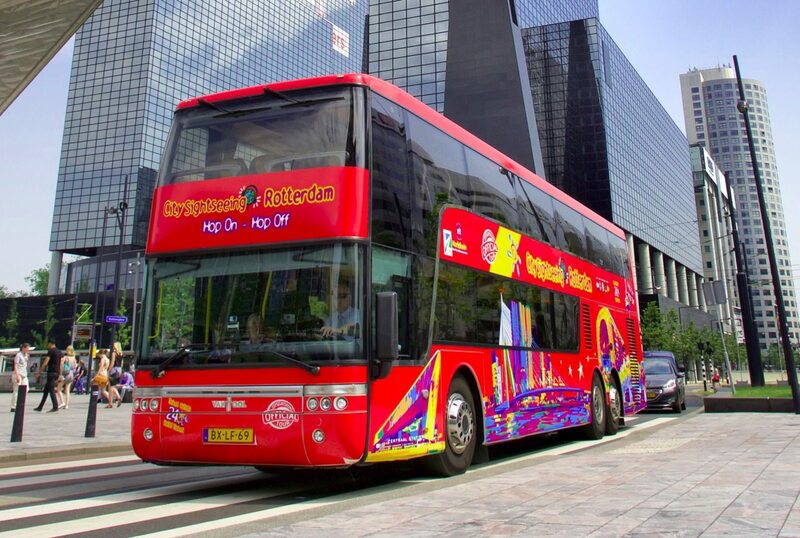 Join us at City Sightseeing Rotterdam and explore Rotterdam in style. With the Hop-On Hop-Off you will ride along the highlights and important sights of Rotterdam. With City Sightseeing Rotterdam you will look at Rotterdam differently. City Sightseeing Rotterdam will take you on an amazing trip, visiting the impressive Market Hall, the amazing Cube houses, the new Central Station and the Euromast. Through a headphone you can get explanations in the following languages: Dutch, English, French, German and Spanish.